Also called *ryousage 両下; iraka-zukuri 甍造. A style of building with a gable roof *kirizuma yane 切妻屋根. Originally called maya 真屋. Before the introduction of new building styles and techniques from the Asian Continent, the gable roof was prized more highly than the hipped roof (then known as *azumaya 東屋). With the advent of Buddhism came the hip-and-gable style *irimoya-zukuri 入母屋造, and a more sophisticated type of hip roof *yosemune-zukuri 寄棟造, the former becoming the more popular. Thenceforth, the gable roof, except for its continued use in certain styles of shrine buildings, particularly *shinmei-zukuri 神明造, and *taisha-zukuri 大社造, was relegated for use on less important structures. Examples include sutra repositories *Kyouzou 経蔵, and dormitories such as the *Higashimuro 東室, *Tsumamuro 妻室 at Houryuuji 法隆寺, and the *Soubou 僧房 at Gangouji 元興寺, both in Nara. The ends of buildings with gable roofs have a triangular space made by the incline of the two sides of the roof. The base of the triangular space is where the inclined roof surfaces form angles at the points of contact with the front and rear walls. 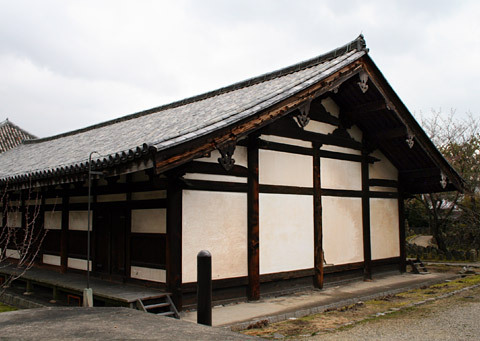 Should the gable ends touch or be attached to other structures so that the gable eaves are not protected, the roof is called *ryousage-zukuri 両下造. When the two sides of the gable roof differ in length from the ridge to the eave ends, the roof is called *maneki-zukuri 招造.